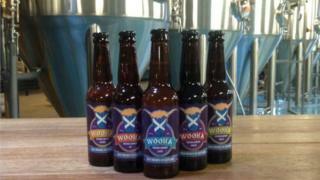 Moray-based brewer WooHa is set to increase its exports to the USA, after securing £700,000 of funding. The company, which specialises in "100% natural, vegan-friendly beers", plans a five-fold increase in production following the purchase of a new site in Kinloss. It is also hiring another four employees, bringing the staff headcount to 10. The company's growth plans have been supported by HSBC. WooHa, which started exporting to the US in January, is aiming to increase its brewing capacity to 2.5 million litres per year in 2019. Founder and owner Heather McDonald said: "We have seen an increased demand from the American market for our Scottish beer - so much so that we forecast that next year, 80% of our business will be from exports, with the US the main market." Susan Rowand, HSBC head of business banking in Scotland, added: "We're seeing an increase in demand for Scottish food and drink products abroad and the USA, in particular, offers a huge opportunity."